(Nanowerk News) In less than a minute, a miniature device developed at the University of Montreal can measure a patient's blood for methotrexate, a commonly used but potentially toxic cancer drug. 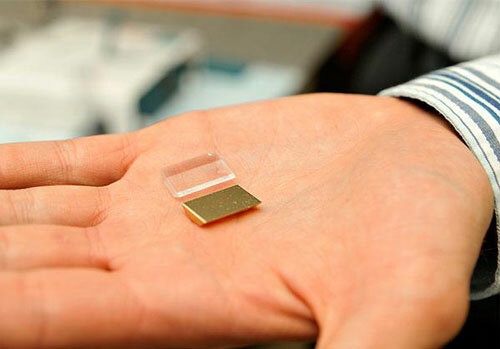 Just as accurate and ten times less expensive than equipment currently used in hospitals, this nanoscale device has an optical system that can rapidly gauge the optimal dose of methotrexate a patient needs, while minimizing the drug's adverse effects. The research was led by Jean-François Masson and Joelle Pelletier of the university's Department of Chemistry. Methotrexate has been used for many years to treat certain cancers, among other diseases, because of its ability to block the enzyme dihydrofolate reductase (DHFR). This enzyme is active in the synthesis of DNA precursors and thus promotes the proliferation of cancer cells. "While effective, methotrexate is also highly toxic and can damage the healthy cells of patients, hence the importance of closely monitoring the drug's concentration in the serum of treated individuals to adjust the dosage," Masson explained. Until now, monitoring has been done in hospitals with a device using fluorescent bioassays to measure light polarization produced by a drug sample. "The operation of the current device is based on a cumbersome, expensive platform that requires experienced personnel because of the many samples that need to be manipulated," Masson said. Six years ago, Joelle Pelletier, a specialist of the DHFR enzyme, and Jean-François Masson, an expert in biomedical instrument design, investigated how to simplify the measurement of methotrexate concentration in patients. Gold nanoparticles on the surface of the receptacle change the colour of the light detected by the instrument. The detected colour reflects the exact concentration of the drug in the blood sample. In the course of their research, they developed and manufactured a miniaturized device that works by surface plasmon resonance. Roughly, it measures the concentration of serum (or blood) methotrexate through gold nanoparticles on the surface of a receptacle. In "competing" with methotrexate to block the enzyme, the gold nanoparticles change the colour of the light detected by the instrument. And the colour of the light detected reflects the exact concentration of the drug in the blood sample. The accuracy of the measurements taken by the new device were compared with those produced by equipment used at the Maisonneuve-Rosemont Hospital in Montreal. "Testing was conclusive: not only were the measurements as accurate, but our device took less than 60 seconds to produce results, compared to 30 minutes for current devices," Masson said. Moreover, the comparative tests were performed by laboratory technicians who were not experienced with surface plasmon resonance and did not encounter major difficulties in operating the new equipment or obtaining the same conclusive results as Masson and his research team. In addition to producing results in real time, the device designed by Masson is small and portable and requires little manipulation of samples. "In the near future, we can foresee the device in doctors' offices or even at the bedside, where patients would receive individualized and optimal doses while minimizing the risk of complications," Masson said. Another benefit, and a considerable one: "While traditional equipment requires an investment of around $100,000, the new mobile device would likely cost ten times less, around $10,000."